The Sport Dog Shock Collar and Remote Trainer for Stubborn Dogs is the first full featured remote shock collar designed for both the professional trainer and the average pet owner with no training experience. A complete, comprehensive training manual shows how to properly use The Remote Trainer to make training a fun and rewarding experience for both the pet and the pet owner. 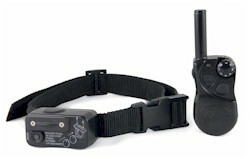 The Remote Trainer can be used to deter unwanted behavior such as digging, chewing on furniture, jumping on guests, or barking. Or it can be used for basic obedience training such as teaching the "come" command.